Police on Wednesday foiled a joint march by separatist leaders Mirwaiz Umer Farooq and Muhammad Yasin Malik by taking them into preventing custody. SRINAGAR: Police on Wednesday foiled a joint march by separatist leaders Mirwaiz Umer Farooq and Muhammad Yasin Malik by taking them into preventing custody here. They were detained just as they started a march towards the city centre Lal Chowk from the nearby Abi Guzar office of the Jammu and Kashmir Liberation Front (JKLF). The two leaders addressed a joint press conference at the JKLF office earlier. Mirwaiz Farooq said the continuing harassment of people in south Kashmir by security forces in the name of operations against militants was condemnable. They also voiced concern over the plight of Kashmiris detained in different jails outside the Kashmir Valley. They criticized Chief Minister Mehbooba Mufti for saying that some people were first stoking agitations and later lining up for administrative favours. "This statement proves she has no connect with the ground realities," Mirwaiz Farooq said. 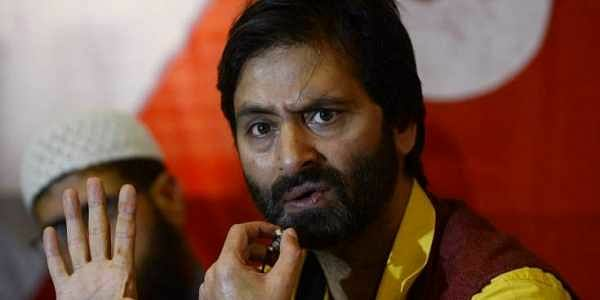 The separatists have called for a Valley-wide shutdown on November 27 to express solidarity with Kashmiris lodged in prisons.